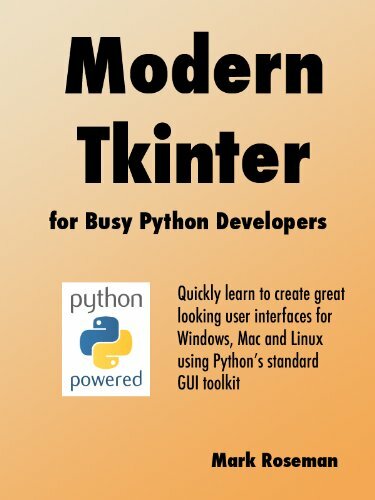 This book will quickly get you up to speed with building attractive and modern graphical user interfaces with Python and Tkinter, it's standard GUI toolkit. Newer versions of Tkinter represent a quantum leap forward, leaving behind the often ugly and outdated Tkinter appearance you may be familiar with. But until now, it's been difficult to find out just how to take advantage of all those exciting enhancements. This book is designed for developers building tools and applications in Tk. It's also concerned with fairly mainstream graphical user interfaces, with buttons, lists, checkboxes, richtext editing, 2D graphics and so on. So if you're either looking to hack on Tk's internal C code, or build the next great 3D immersive game interface, this is probably not the material for you. This book also doesn't teach you the Python programming language (the book uses Python 3), so you should have a basic grasp on that already. Similarly, you should have a basic familiarity with desktop applications in general, and while you don't have to be a user interface designer, some appreciation of GUI design is always helpful. Whether you are entirely new to Tkinter, or just need to bring your Tkinter knowledge up to date, this book will give you everything you need to start building modern, attractive Tkinter-based user interfaces that run on Windows, Mac and Linux. This book brings together Python-specific information from the multi-lingual TkDocs.com website, and supports further development of that site.